Death came early to Hood Canal this year, demonstrating just how odd and unpredictable ocean conditions can be. Fish kills caused by low-oxygen conditions in southern Hood Canal usually occur in late September or October. That’s when low-oxygen waters near the seabed are pushed upward by an intrusion of heavier water coming in from the Pacific Ocean and creeping along the bottom. Winds out of the south can quickly blow away the surface waters, leaving the fish with no escape. That’s basically what happened over the past month, as conditions developed about a month earlier than normal. South winds led to reports of fish dying and deep-water animals coming to the surface to get enough oxygen, with the worst conditions occurring on Friday. Check out the video on this page by Seth Book, a biologist with the Skokomish Tribe, who found deep-water ratfish swimming near the surface. The story of this year’s strange conditions actually begins about a year ago and involves a 1,000-mile-long “blob” of unusually warm ocean water off the West Coast. State Climatologist Nick Bond, who coined the term “blob,” explains its formation in an article in Geophysical Research Letters with a summarized description by Hannah Hickey in UW Today. The warm, low-density coastal waters related to the blob came into Hood Canal on schedule last fall, but they were not dense enough to flush out the low-oxygen waters, according to University of Washington oceanographer Jan Newton. Hood Canal entered 2015 with the least-dense waters at depth over the past 10 years. They remained in a hypoxic state, meaning that levels were below 2.5 parts per million. 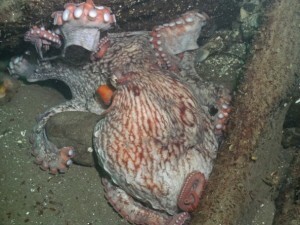 Sea creatures unable to swim away can be unduly stressed and unable to function normally at that level. Conditions worsened into the summer, when the hypoxic layer at Hoodsport grew to about 300 feet thick. 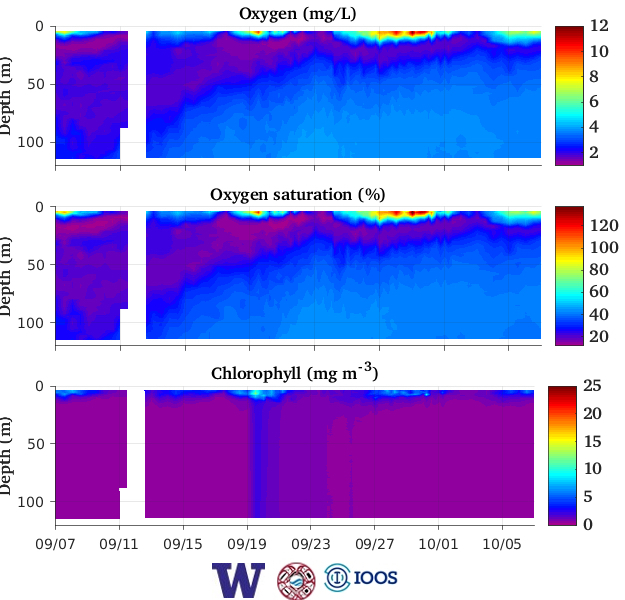 By then, the annual intrusion of deep seawater with somewhat elevated oxygen levels was on its way into Hood Canal, spurred on by upwelling off the coast. This year’s waters are more normal in density, though their arrival is at least a month early. 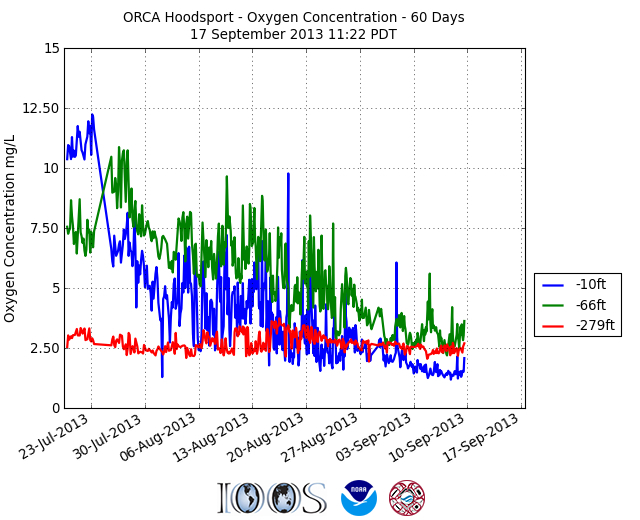 By August 9, the hypoxic layer at Hoodsport was reduced from 300 to 60 feet, pushed upward by the denser water. It’s always interesting to see this dynamic play out. The layer of extreme low-oxygen water becomes sandwiched between the higher-oxygen water pushing in from the ocean and the surface water, which ordinarily stays oxygenated by winds and incoming streams. Without south winds, the middle low-oxygen layer eventually comes up and mixes into the surface layer. If south winds come on strong, however, the surface layer is blown to the north, causing the low oxygen water to rise to the surface. Fish, shrimp and other creatures swim upward toward the surface, trying to stay ahead of the rising low-oxygen layer. When the low-oyygen layer reaches the surface, fish may struggle to breathe in the uppermost mixing layer. Unfortunately, the fish have no way of knowing that safer conditions lie down below — beneath the low-oxygen layer and within waters arriving from the ocean. Jan Newton reported that the low oxygen levels in southern Hood Canal earlier this year were the most extreme measured over the past 10 years. So far, however, the fish kills don’t seem as bad as those in 2003, 2006 and 2010, she said. The graph below shows how the deep layer coming in from the ocean at 279 feet deep contains more oxygen than the middle layer at 66 feet deep. The surface layer, which normally contains the most oxygen, dipped to extremes several times near the beginning of August and again on Friday, Aug. 28. These data, recorded from a buoy near Hoodsport, are considered unverified. Will Hood Canal experience a fish kill this year? The Hoodsport monitoring buoy was placed back online yesterday. The dissolved oxygen levels at the surface are much higher now than they were two weeks ago, coming up to about 9 milligrams per liter at a 10-foot depth. But oxygen levels in the middle layer remain about the same — about 2.5 milligrams per liter. And the middle layer still contains less oxygen than levels close to the bottom, which is getting an infusion of heavy seawater from the ocean. A south wind could still bring low-oxygen waters to the surface, but I don’t believe the levels are low enough to cause a fish kill. Still, the low-oxygen water could force deep-water fish to move upward in the water column. I’m waiting to hear from divers if they are seeing anything unusual, and I’ll let you know if conditions take a turn for the worse. Are we about to see one of the infamous fish kills that we have observed in Southern Hood Canal in past years? I am unable to sound any alarms at this time, but if you live in the Hoodsport-Potlatch area or are scuba diving nearby, you might want to watch for dead fish on the surface, rockfish or shrimp swimming in shallow water, or wolf eels and octopuses acting strangely. Usually, we can look to the monitoring buoy offshore of Hoodsport to answer questions about whether fish are starving for oxygen. The buoy tells us about dissolved oxygen levels at all depths. I watch this buoy every fall for clues about dangerous conditions, such as when the surface and middle layers of Hood Canal become depleted of oxygen. Unfortunately, the Hoodsport ORCA buoy has been down for most of the past 10 days. University of Washington technicians are trying to get it back in operation, but it appears to be an Internet/local-network problem at the moment. As of Sept. 10, the surface layer at 10 feet deep was down to less than 2 milligrams per liter, an alarming level, and conditions were not much better at 66 feet. (See chart.) That means there is a lot of low-oxygen water that could be brought to the surface when we get a wind blowing out of the south. Well, we’ve had some moderate south winds today, and I’m wondering what is happening out there right now. South winds blow the surface layer away and bring low-oxygen water up from the depths. Fish may come to the surface seeking better conditions, but they may find oxygen levels even worse as they go up — and the fish have no idea that better conditions may lie below. So far, I have not seen any concerns posted on the Facebook pages of divers who may have gone out recently. Feel free to post a comment to this blog or send me an email (cdunagan@kitsapsun.com) if you see or hear anything that can contribute to the discussion. A statewide hotline used to report oil spills also will take your calls and alert biologists to reports of dead fish. That number is (800) OILS-911. 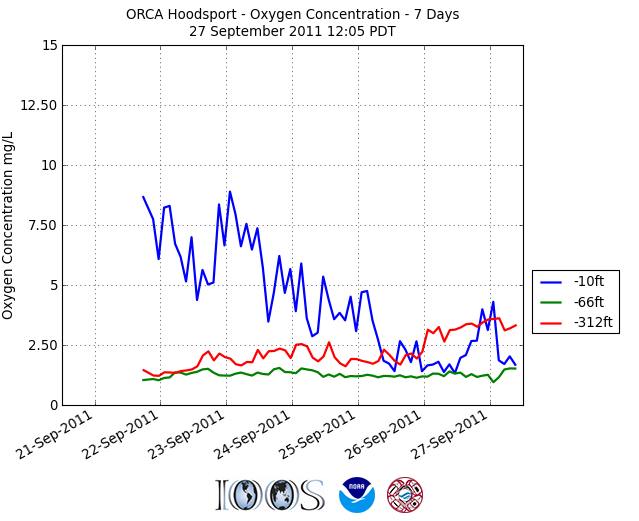 I’m becoming something of a nerd when it comes to oxygen levels in southern Hood Canal. I’m sure it stems from the realization that we now have the technology to predict when fish will react to low-oxygen conditions by swimming to the surface, acting sluggish and sometimes dying. 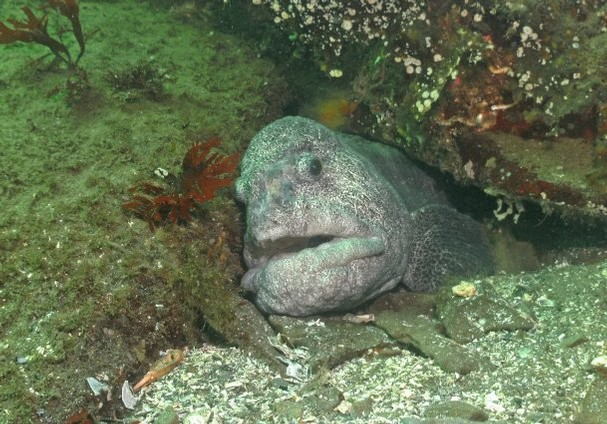 Wolf eels at Sund Rocks in Hood Canal are disturbed by low-oxygen conditions. In a story published in Monday’s Kitsap Sun, I took a step back from the immediate low-oxygen conditions and discussed our knowledge of Hood Canal, along with plans being formulated to address the low-oxygen problem. Low-oxygen conditions reared their ugly head during the last week in September (Water Ways, Sept. 27). No major fish kills were reported before things began to improve somewhat by Friday (Water Ways, Sept. 30). I’m keeping my eye on the charts and graphs and noticed a couple things that we can talk about. 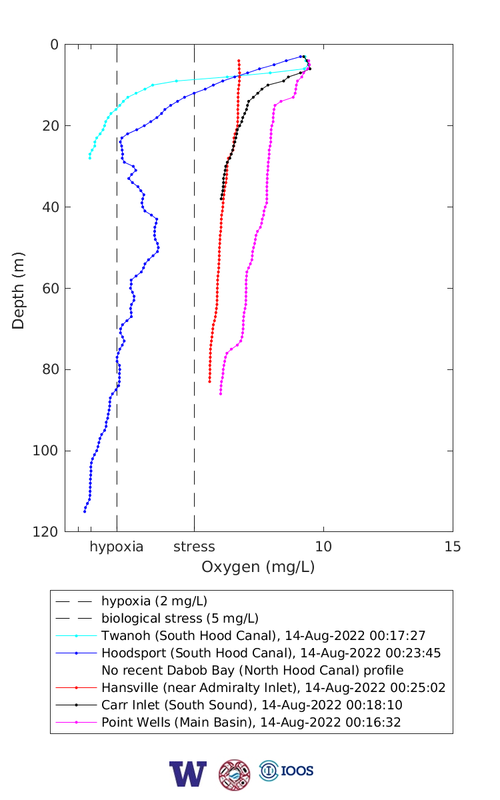 Compare the two oxygen profiles below with an eye to the surface conditions at Hoodsport (blue line) and deeper waters there below 40 meters. The first thing I noticed was that the top of the hypoxic layer moved up from about 17 to 10 meters. That means if fish are avoiding that low-oxygen water, they will also move up. As far as I know, divers have not reported any observations to confirm or deny that change. One explanation is that the heavy ocean layer at the bottom is pushing up the entire water column. It also could mean that the surface layer has grown thinner, such as when south winds blow or north winds stop. Meanwhile, the bottom of that middle hypoxic layer has moved up from about 70 to 50 meters and the edge has smoothed. That is an indication that the heavy ocean water, which contains more oxygen, is mixing with the bottom of the hypoxic layer. 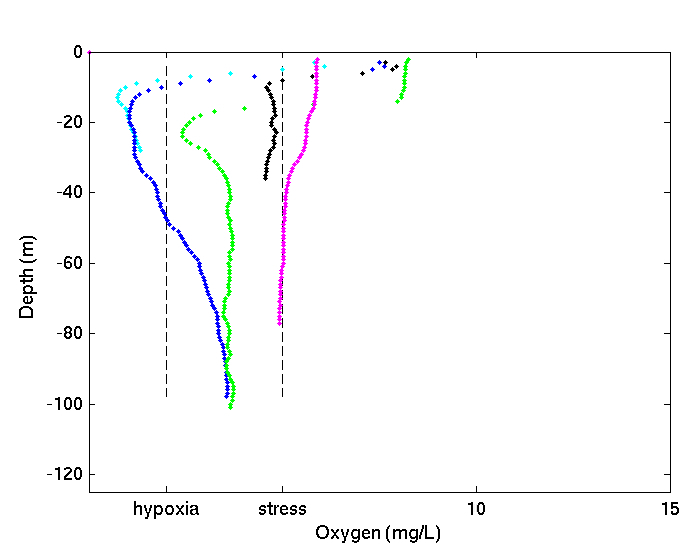 One may also notice that the deep water at Twanoh (turquoise line) has become more oxygenated all the way through and is sharply higher in oxygen at the bottom. Perhaps this is an indication that the heavy ocean water has reached Twanoh and is mixing at the bottom, while winds and tides mix the water at the top. University of Washington oceanographer Jan Newton has noticed a decline in the oxygen concentration in the middle layer at Hoodsport. She raises the prospect that this could result, in part, from low-oxygen water being pushed back from Lower Hood Canal by the annual intrusion of heavy ocean water. It needs to be checked further, she said. I hope we get some diver observations this weekend or sooner. In discussing the current conditions with Dan Hannifious of Hood Canal Salmon Enhancement Group, we both wondered when deep-water fish will move back to their normal depth. What would it take for them to break through the middle low-oxygen layer to reach deeper water that is higher in oxygen. Will the conditions in Hood Canal get better or worse this year? I’ll let you know, but if you see something unusual, feel free to post a comment here. Fish and other sea creatures are finding some room to breathe in southern Hood Canal as higher oxygen levels have returned to the upper portion of the waterway after things looked pretty bleak on Monday. See Water Ways post. I reported yesterday that fish could safely go down to 60 feet in a story posted on the Kitsap Sun website, but conditions are changing all the time. Now it looks like the cutoff depth is closer to 50 feet, while waters closer to the surface appear to be more oxygenated than yesterday. I discussed the situation with Dan Hannifious of the Hood Canal Salmon Enhancement Group and included some of Dan’s comments in the story. Rather than repeat those comments here, I’ll let you click on the story. What I did want to share are a couple graphs that show current conditions as of 9:30 this morning. Most of the real-time analysis comes from monitoring buoys in Hood Canal. This is a profile of the oxygen levels from the surface down to the bottom of Hood Canal, or close to it. The blue line is for the Hoodsport buoy, turquoise for Twanoh and green for Dabob Bay. The black line is for Carr Inlet in South Puget Sound and purple is Point Wells near Edmonds. 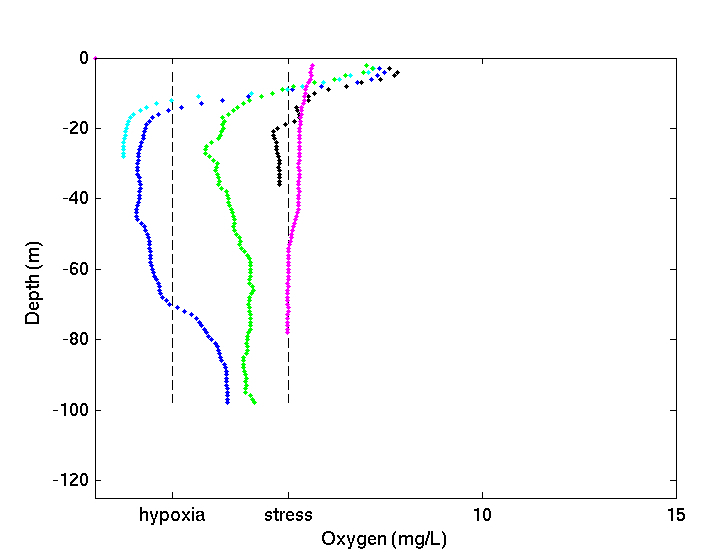 Biological "stress" occurs at less than 5 milligrams per liter, while "hypoxia" is shown at 2 mg/l. At Hoodsport, if fish go below about 18 meters, they will be in hypoxic conditions. Earlier this week, these condition were seen at the surface. 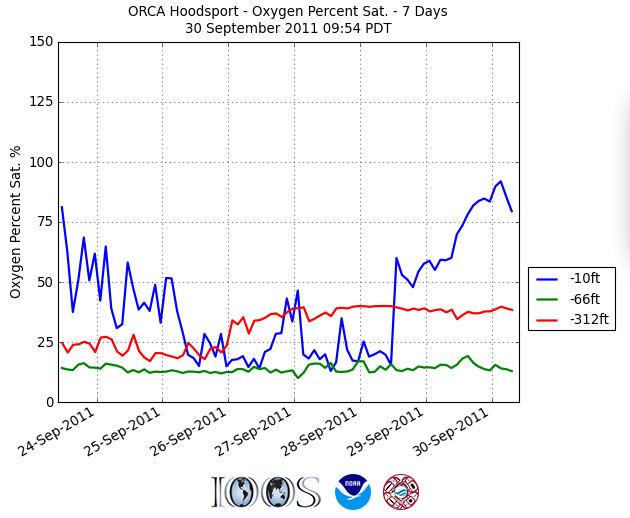 Data from the Hood Canal Dissolved Oxygen Program. This graph shows changes over time. While conditions have gotten better near the surface (blue line), it doesn't show much change at 66 feet (green line). As we can see in the previous graph, the changes are occurring in shallower water and will take time to reach this depth. The red line shows the intrusion of heavy seawater containing more oxygen. When comparing, remember one graph uses meters, the other feet. How do we address Hood Canal’s oxygen deficit? Five years ago, a lot of people were wondering why fish were dying more often in southern Hood Canal during the fall. Researchers knew that Hood Canal was sensitive to nitrogen. In other words, when nitrogen was introduced to the canal during summer months, nearly all of it was taken up by plankton, which grew into large blooms. When the plankton died, they sank to the bottom, where bacterial decay sucked up the available oxygen. Beyond that, the questions were numerous: What were the most critical sources of nitrogen affecting the low-oxygen problem? What role does weather and water circulation play? And what can humans do to help the problem — or at least keep it from getting worse. After a five-year, $4-million study, these questions can be answered with some certainty, as I point out in a story in Sunday’s Kitsap Sun. Now it is time for researchers to convey this information to political leaders and the public, as the Hood Canal Coordinating Council prepares a plan of action. Scott Brewer, executive director of the HCCC, told me that the eventual plan is likely to include a suite of actions to address nitrogen inputs to the canal, particularly from human sources. Conditions have remained pretty much the same the last couple of days, although the intrusion of dense higher-oxygen water from the ocean is beginning to create a thicker layer at the bottom of Hood Canal. The middle layer of low-oxygen water remains fairly thick, but the upper layer with higher oxygen concentrations is still providing fish some relief. South winds remain a threat, as I’ve explained for the last few weeks. One can observe the three layers in the upper graph. The lower graph shows changes over the past week or so. 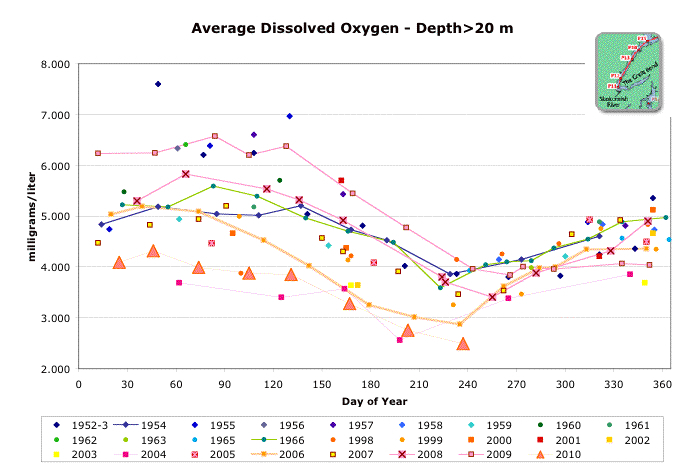 Notice how oxygen concentrations are rising in the deep layer. I hate to be the voice of doom, but low-oxygen conditions in Hood Canal have never been worse — if you can believe the data gathered since the 1950s, alongside more intense monitoring the past several years. In the southern portion of Hood Canal, you only need to go down about 30 feet to begin to see stressful oxygen levels in the range of 2 milligrams per liter. 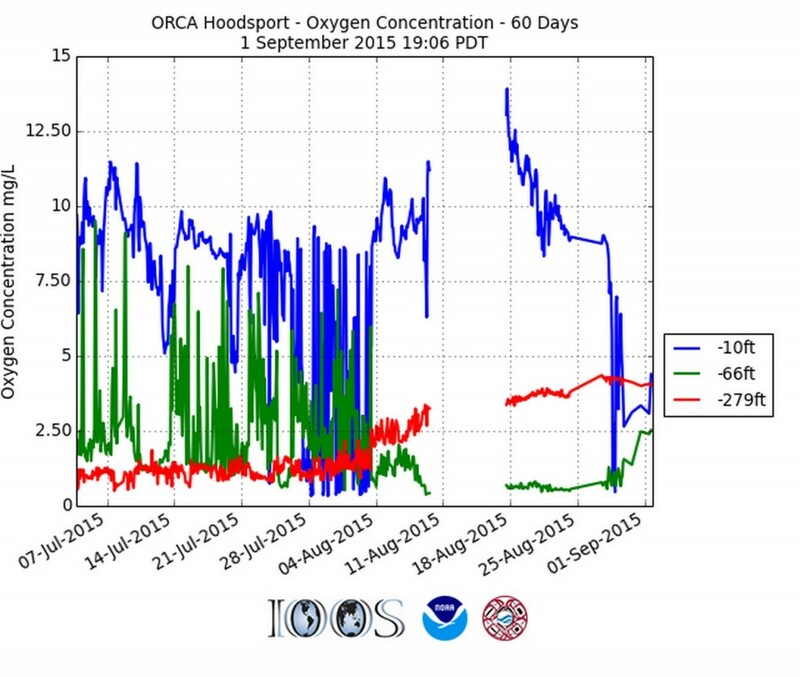 For current conditions at Hoodsport, go directly to the Hood Canal Dissolved Oxygen Program’s website, which lists data sent back from the Ocean Remote Chemical Analyzer (ORCA). Sea creatures are beginning to show signs of stress, according to scuba diver Janna Nichols, who described her findings to me Wednesday after a dive in Hood Canal. She talked about fish “panting” as their gills moved in and out rapidly. Some fish, shrimp and other sealife had moved into shallower water. Watch Janna’s video of a wolf eel and other visuals she captured on the dive. When low-oxygen conditions are that close to the surface, the danger is that a south wind will blow away the surface layer and bring low-oxygen water right to the surface, leaving fish with no place to go. Of course, I have no desire to see a massive fish kill, but we already know that fish are probably dying in deep water due to the stressful conditions. I collect this information and offer these reports so that people can alert researchers when something happens. Being on the scene when fish are dying could provide important information about the nature of the low-oxygen problem. For details, please check out my stories in the Kitsap Sun Sept. 7 and Sept. 15 as well as the more technical report from Jan Newton on Sept. 7 (PDF 320 kb). If you haven’t heard, the worst low oxygen conditions normally occur in the fall after a summer of burgeoning numbers of plankton, encouraged by nitrogen and sunlight. By fall, much of the plankton has died and dropped to the bottom, where decay consumes the available of oxygen. While there are plenty of natural sources of nitrogen in Hood Canal, computer models have demonstrated that human inputs from septic systems and stormwater can push things over the edge in the fall. Officials are hoping that a new sewage-treatment plant in Belfair will begin to reduce the inputs of nitrogen into Lynch Cove. Another treatment plant is being planned in Potlatch. Stormwater upgrades also are being proposed for Belfair and other areas. In addition to the low-oxygen problem, Hood Canal was closed to the harvest of oysters after people became sick from vibriosis, a natural bacteria that multiplies in warm conditions. See Kitsap Sun story Sept. 10 and Washington Department of Health maps. The orange triangles represent this year's composite oxygen levels for the south half of Hood Canal. The latest reading, near the end of August, is the lowest ever seen.